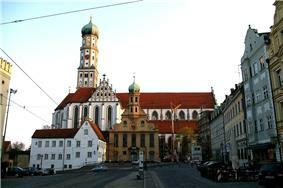 Augsburg (German pronunciation: ( )) is a city in the south-west of Bavaria, Germany. It was a Free Imperial City for over 500 years. It is a university town and home of the Regierungsbezirk Schwaben and the Bezirk Schwaben. Augsburg is an urban district and home to the institutions of the Landkreis Augsburg. 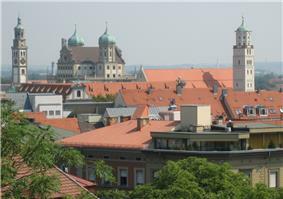 It is the third-largest city in Bavaria (after Munich and Nuremberg) with a population exceeding 280,000 citizens. 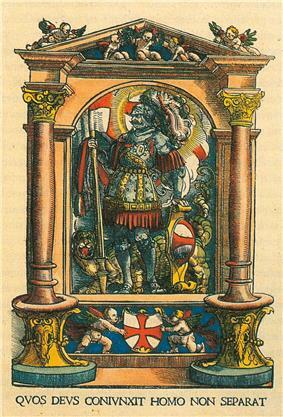 After Neuss and Trier, Augsburg is Germany's third oldest city, being founded by the Romans as Augusta Vindelicorum, named after the Roman emperor Augustus. 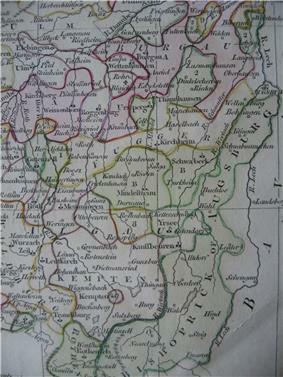 Augsburg lies at the convergence of the Alpine rivers Lech and Wertach and on the Singold. The oldest part of the city and the southern quarters are on the northern foothills of a high terrace, which emerged between the steep rim of the hills of Friedberg in the east and the high hills of the west. In the south extends the Lechfeld, a Outwash plain of the post ice age between the rivers Lech and Wertach, where rare primeval landscapes were preserved. The Augsburg city forest and the Lech valley heaths today rank among the most species rich middle European habitats. On Augsburg borders the nature park Augsburg Western Woods - a large forestland. The city itself is also heavily greened. Because of that the city won in the Europe-wide contest Entente Florale 1997 as the first German city the prize as greenest and most livable city. The city was founded in 15 BC by Drusus and Tiberius as Augusta Vindelicorum (), on the orders of their stepfather Emperor Augustus. 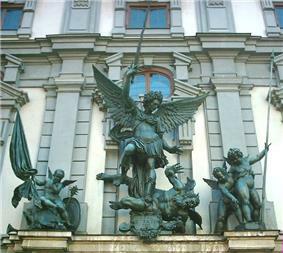 The name means "Augusta of the Vindelici". This garrison camp soon became the capital of the Roman province of Raetia. Historical spellings of the name of the city include "Ausburch" and "Ausbourch." 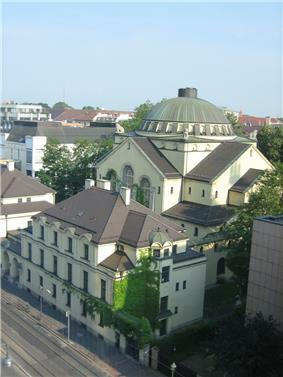 Religious peace in the city was largely maintained despite increasing Confessional tensions until the Thirty Years' War (1618–1648). In 1629, Ferdinand II issued the Edict of Restitution, which restored the legal situation. 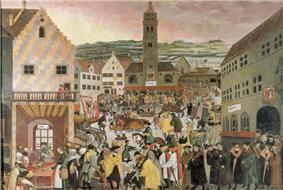 of 1552 which again curtailed the rights of the Protestant citizens. The inequality of the Edict of Restitution was rescinded when in April 1632, the Swedish army under Gustavus Adolphus captured Augsburg without resistance. In 1686, Nine Years War. 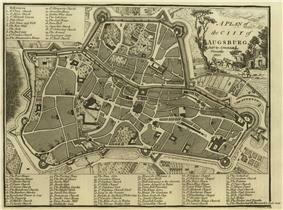 Augsburg was historically a militarily important city due to its strategic location. During the German re-armament before the Second World War, the Wehrmacht enlarged Augsburg's one original Kaserne (barracks) to three: Somme Kaserne ((housing Wehrmacht Artillerie-Regiment 27)); Arras Kaserne ((housing Wehrmacht Infanterie Regiment 27)) and Panzerjäger Kaserne (housing Panzerabwehr-Abteilung 27 (later Panzerjäger-Abteilung 27). Wehrmacht Panzerjäger-Abteilung 27 was later moved to Füssen. The Reichswehr Infanterie Regiment 19 was stationed in Augsburg and became the base unit for the Wehrmacht Infanterie Regiment 40, a subsection of the Wehrmacht Infanterie Division 27 (which later became the Wehrmacht Panzerdivision 17). Elements of Wehrmacht II Battalion of Gebirgs-Jäger-Regiment 99 (especially Wehrmacht Panzerjäger Kompanie 14) was composed of parts of the Wehrmacht Infanterie Division 27. The Infanterie Regiment 40 remained in Augsburg until the end of the war, finally surrendering to the United States when in 1945, the U.S. Army occupied the heavily bombed and damaged city. Following the war, the three Kaserne would change hands confusingly between the American and Germans, finally ending up in US hands for the duration of the Cold War. 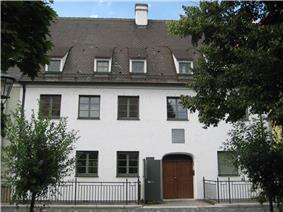 The former Wehrmacht Kaserne became the three main US barracks in Augsburg: Reese;, Sheridan and FLAK. US Base FLAK had been an anti-aircraft barracks since 1936 and US Base Sheridan "united" the former infantry barracks with a smaller Kaserne for former Luftwaffe communications units. The American military presence in the city started with the 11th Airborne Division, followed by the 24th Infantry Division, U.S. Army Seventh Corps Artillery, 701st Military Intelligence Brigade and finally the 66th Military Intelligence Brigade, which returned the former Kaserne to German hands in 1998. Originally the Heeresverpflegungshauptamt Südbayern and an Officers' caisson existed on or near the location of Reese-Kaserne, but was demolished by the occupying Americans. The Augsburg tramway network is now 35.5 km-long after the opening of new lines to the university in 1996, the northern city boundary in 2001 and to the Klinikum Augsburg (Augsburg hospital) in 2002. Tram line 6, which runs 5.2 km from Friedberg West to Rotes Tor, opened in December 2010. Augsburg has six stations, the Central Station (Hauptbahnhof), Hochzoll, Oberhausen, Morellstraße and Messe. The Central Station, built from 1843 to 1846, is Germany’s oldest main station in a large city still providing services in the original building. It is currently being modernized and an underground tram station is built underneath it. Hauptbahnhof is on the Munich–Augsburg and Ulm–Augsburg lines and is connected by ICE and IC services to Munich, Berlin, Dortmund, Frankfurt, Hamburg and Stuttgart. As of December 2007, the French TGV connected Augsburg with a direct High Speed Connection to Paris. In addition EC and night train services connect to Amsterdam, Paris and Vienna and connections will be substantially improved by the creation of the planned Magistrale for Europe. Until 2005 Augsburg was served by nearby Augsburg Airport (AGB). In that year all air passenger transport was relocated to Munich Airport. Since then the Airport has only served for General aviation and business aviation. 1740–1786 Christoph Christian Sturm, German preacher and author. 1873-1964 Hans von Euler-Chelpin, co-recipient of 1929 Nobel Prize in Chemistry. 1898–1956 Bertolt Brecht, famous German writer. 1920–2011 Mietek Pemper, compiled and typed Oskar Schindler's list, which saved 1,200 Jewish prisoners from the Holocaust. 1957 Bernhard Langer, famous professional golfer. 1959 Bernd Schuster, a German football coach and former player. 1961 Armin Veh, a German football coach. 1980 Benny Greb, a German solo drum artist. 1983 Philipp Kohlschreiber, a German tennis player. 1985 Bianca Voitek, a German female bodybuilder. 1985 Annina Braunmiller, a German voice actress. 1989 Johnny Cecotto, Jr., a German racing career. FC Augsburg is a football team based in Augsburg and plays in the SGL arena. 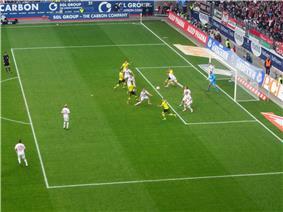 FC Augsburg was promoted to Bundesliga in 2011. The new stadium (opened in July 2009) also hosted games of the 2011 FIFA Women's World Cup. The city is home to a DEL (first-division) ice hockey team, the Augsburger Panther. The original club, AEV, was formed in 1878, the oldest German ice sport club and regularly draws around 4000 spectators, quite reasonable for German ice hockey. Home games are played at the Curt Frenzel Stadion: a recently rebuilt (2012-2013) indoor rink and modern stadium. Also Augsburg is home to one of the most traditional German Baseball clubs, the Augsburg Gators. Among the younger people, the city is commonly called "Aux" as a short form. ^ "Stadt Augsburg - Home - Stadt Augsburg". 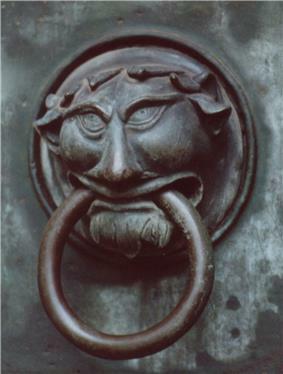 .augsburg.de. 2014-05-01. Retrieved 2014-05-05. 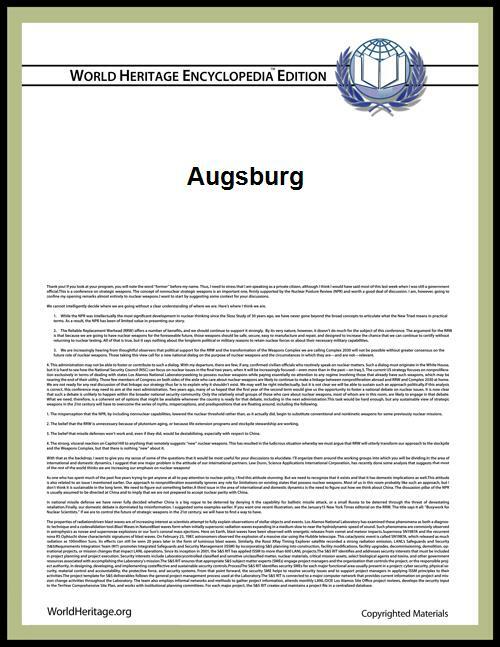 ^ "Augsburg". Collins Dictionary. n.d. Retrieved 26 September 2014. ^ "Statistisches Jahrbuch 2012". 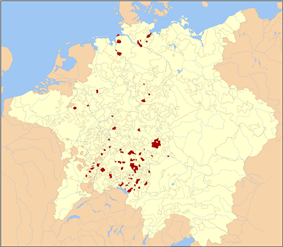 Stadt Augsburg (Amt für Statistik und Stadtforschung). Retrieved 2014-07-23. ^ "Oskar Schindler's collaborator, Mietek Pemper, has died". ^ Martin, Douglas (2011-06-18). "Mietek Pemper, 91, Camp Inmate Who Compiled Schindler’s List".